Pointer (English Pointer) is an excellent gun dog. 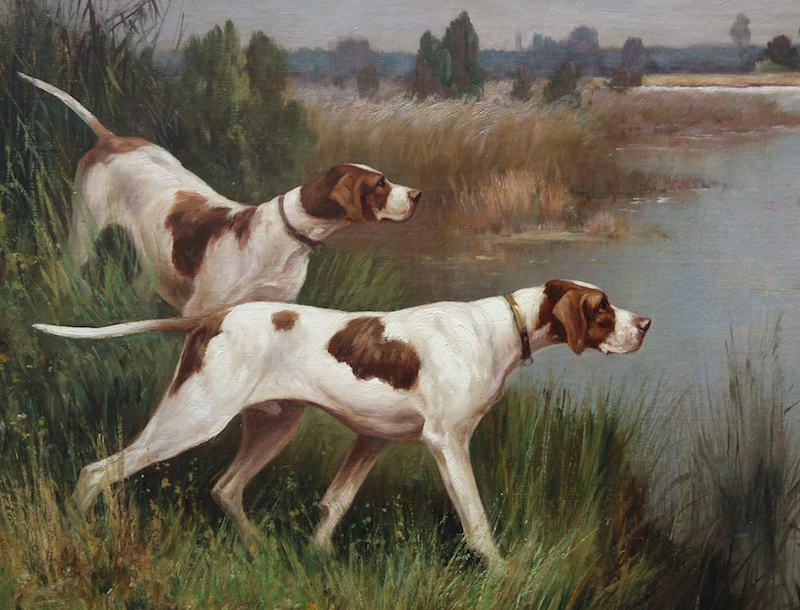 The Pointer dog breed was named for the work he does – pointing game for the hunter. Britain is the breed’s country of development though the lineage traces back to a number of imported European sporting breeds. Because European dogs were too slow afield for British tastes, various crosses to other breeds were used to improve speed, scenting power, stamina and concentration. The Greyhound, Foxhound and setter may have contributed. 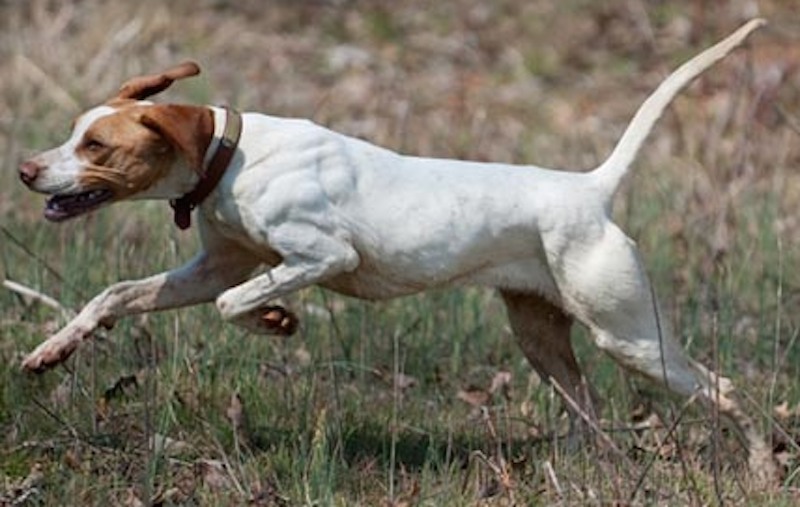 By the mid-19th century, the Pointer had arrived and then, as now, it was a hard-driving hunting dog who has always been a top contender in field trials. 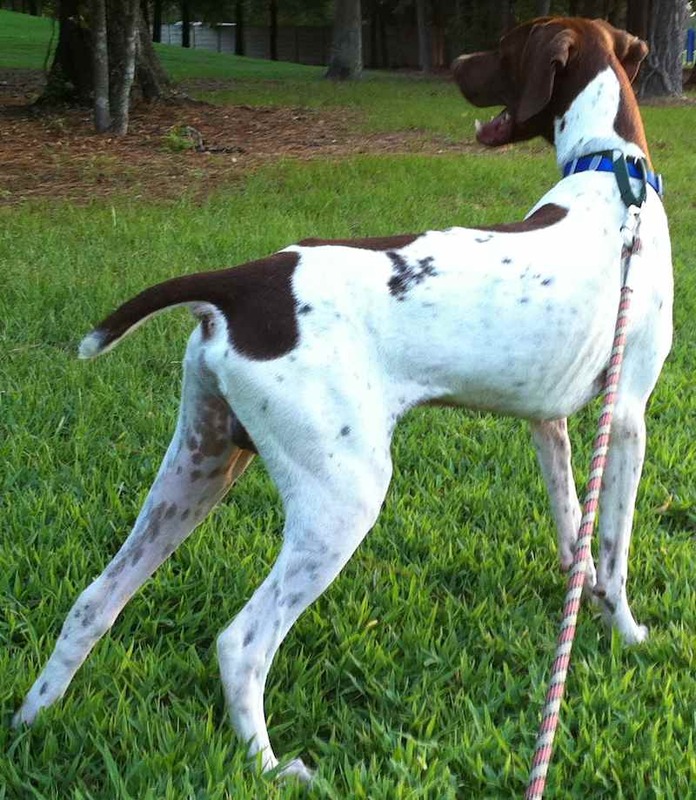 General Appearance: The English Pointer is bred primarily for sport afield; he should unmistakably look and act the part. The ideal specimen gives the immediate impression of compact power and agile grace; the head noble, proudly carried; the expression intelligent and alert; the muscular body bespeaking both staying power and dash. 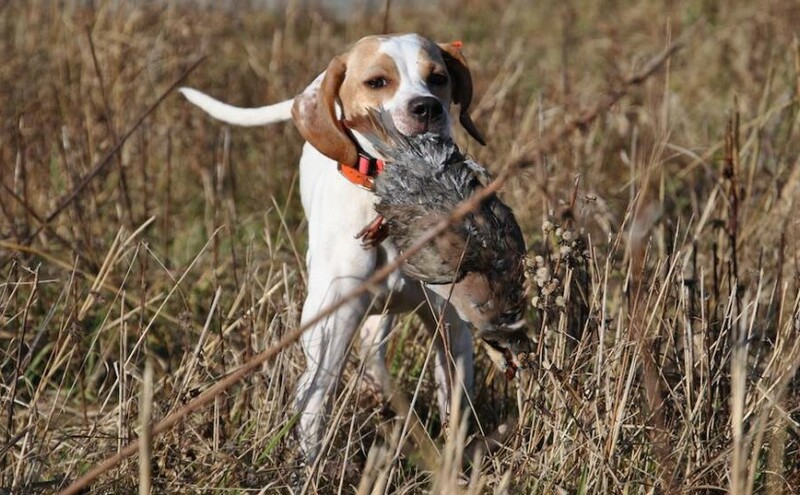 Here is an animal whose every movement shows him to be a wide awake, hard-driving hunting dog possessing stamina, courage, and the desire to go. And in his expression are the loyalty and devotion of a true friend of man. 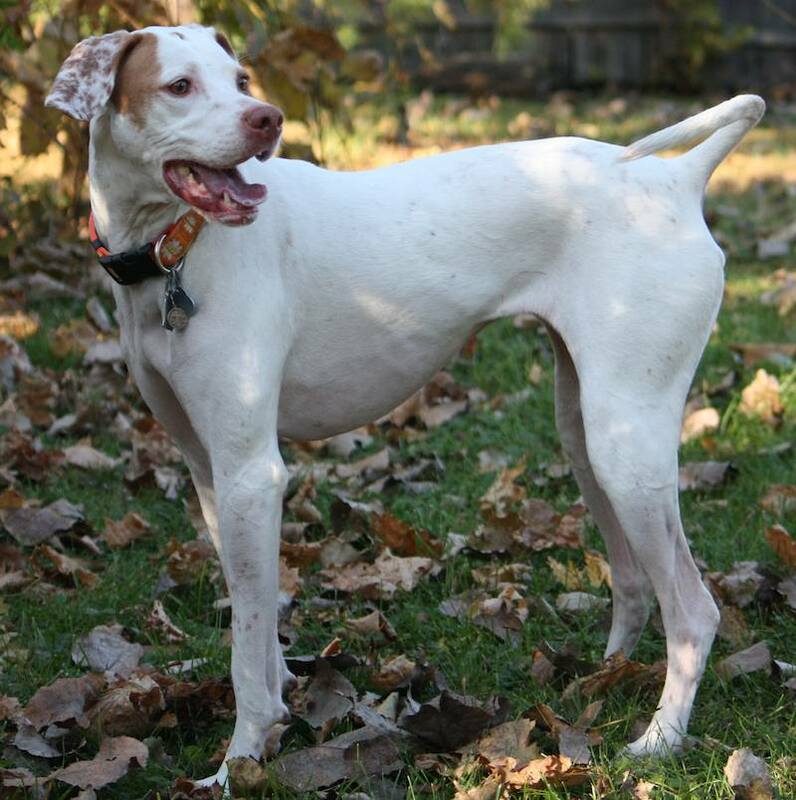 Size: Balance – over-all symmetry – is much more important in the English Pointer than size. It is just as vital in a dog bred for field work as it is in an athlete or a racehorse, and for the same reasons: it indicates muscular co-ordination, endurance, and an equilibrium of power. Whether large or small, a well put together English Pointer, smooth all over, is to be preferred to an uneven one with contrasting good and bad points. Provided there is balance, considerable variation in size and weight is permissible. Coat and Colour: Coat short, dense, smooth with a sheen. Liver, lemon, black, orange; either in combination with white or solid-coloured. A good English Pointer cannot be a bad colour. In the darker colours, the nose should be black or brown; in the lighter shades it may be lighter or flesh-coloured. Head: Skull long and proportionately wide, but indicating length rather than width. Slight furrow between the eyes, cheeks cleanly chiseled. A pronounced stop midway between nostrils and occiput. Muzzle long, in the same plane as the skull. Nostrils large, spongy, widely open. Jaws ending level and square, with scissors or even bite, the flews clean. Eyes of medium size, rounded, pleasant in expression and the darker the better. Ears set on at eye level. When hanging naturally, they should be somewhat pointed at the tip – never round – and soft and thin in leather. They should reach below the lower jaw, close to the head, with little or no folding. Neck: Long, dry, muscular and slightly arched, springing cleanly from the shoulders. Forequarters: Shoulders long, thin, and sloping. The top of blades close together. Elbows well down, directly under the withers and truly parallel, so as to work just clear of the body. Forelegs straight and with oval bone. Knee joint never to knuckle over. Pasterns of moderate length, perceptibly finer in bone than the leg, and slightly slanting. Body: Back strong and solid, with only a slight rise from croup to top of shoulders. Chest, deep rather than wide, must not hinder free action of the forelegs. The breastbone bold without being unduly prominent. The ribs well sprung, descending as low as the elbow-point. Loin of moderate length, powerful and slightly arched. Croup falling only slightly to base of tail. Tuck-up should be apparent, but not exaggerated. Hindquarters: Muscular and powerful, with great propelling leverage. Thighs long and well developed. The hocks clean and parallel. Stifles wide and well bent. Decided angulation is the mark of power and endurance. Feet oval, with long, closely-set arched toes, well padded, and deep. Tail: Heavier at the root, gradually tapering to a fine point. Length no greater than to reach to the hock joint. Carried straight, ideally on a level with the back. Gait: Smooth and frictionless, with a powerful hindquarters’ drive. 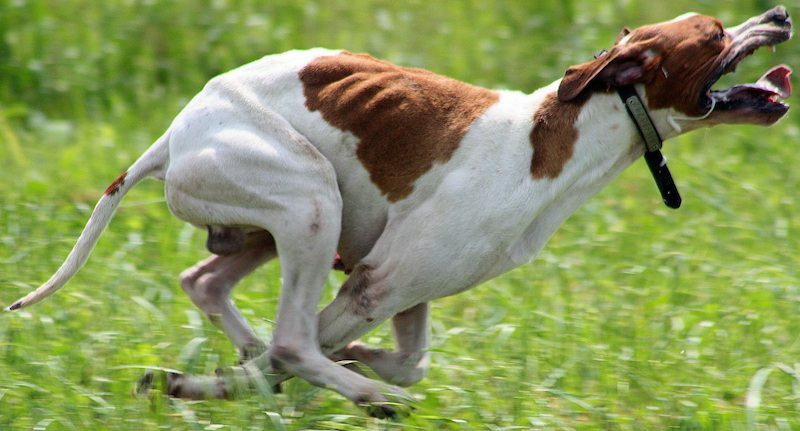 The head should be carried high, the nostrils wide, the tail moving from side to side rhythmically with the pace, giving the impression of a well balanced, strongly built hunting dog capable of top speed combined with great stamina. 1. General Appearance – Lack of true Pointer type, hound or terrier characteristics. 2. Temperament – timid, unruly. 3. Head – Blocky or apple head. Short or snipey muzzle or frog face. Bulging cheeks or pendulous flews. Lack of stop, downfaced, Roman nose. Undershot or overshot. Small or dry nostrils. 4. Ears – Low set, round, heavy, folded, leathery or hound ears. 5. Eyes – Light, hard, almond, or staring eyes. 6. Neck – Ewe neck. Throatiness. Short, thick neck. 7. Shoulders – Loaded or bossy shoulders. Set wide apart at top. Straight shoulder, no slope. 8. Front – Elbows turned either in or out. Forelegs knuckled over. Straight pasterns, terrier-front. Bone of forelegs coarse, fine, or round. Narrow chested, shallow, shelly, pigeon-breasted. Chest too wide, resulting in elbows out. Ribs too flat or too barreled. 9. Back – Roach or sway back. Unbalanced length of body. Cobbiness. Steep rise, or none at all, in topline. Sagging or long, thin loin. Croup falling away too sharply. 10. Tail – Rat tail. Set on too high or too low. Carried between the legs, or carried high, flag-pole tail. 11. Hindquarters – Straight or narrow stifles. Cow-hocks. Lack of angulation or straight in stifle. Any suggestion of weakness in hindquarters. 12. Feet – Cat-foot. Thin or soft pads. Splayed feet. Flat toes. 13. Coat – Long hair or curl. Soft or silky coat. 14. Colour – Weak or washed-out colours. Light or flesh-coloured nose in a dark-coloured dog. Butterfly nose. 15. Gait – Crossing-over, sprawling or side-tracking. Stepping too high in front — the hackney gait.